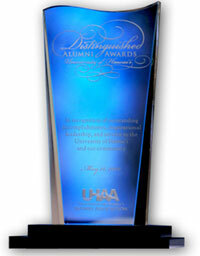 The University of Hawaiʻi Alumni Association is accepting nominations for the 2012 Distinguished Alumni Awards. Alumni from any of the University of Hawaiʻi’s 10 campuses are eligible to be nominated. The deadline for submitting entries is November 10. Recipients will be announced in January 2012. The Distinguished Alumni Awards pays tribute to notable alumni who bring high honor to themselves, the community and the University of Hawaiʻi. These outstanding individuals will be honored at the Distinguished Alumni Awards dinner on May 10, 2012. For nomination criteria, a list of past honorees and more information about the UHAA Distinguished Alumni Awards, visit the UHAA website or contact the Office of Alumni Relations at (808) 956-ALUM (2586) or (877) UH-ALUM (842-5867). The deadline for nominations has been extended until Nov. 10. This story list is automatically generated from the Mālamalama archives.